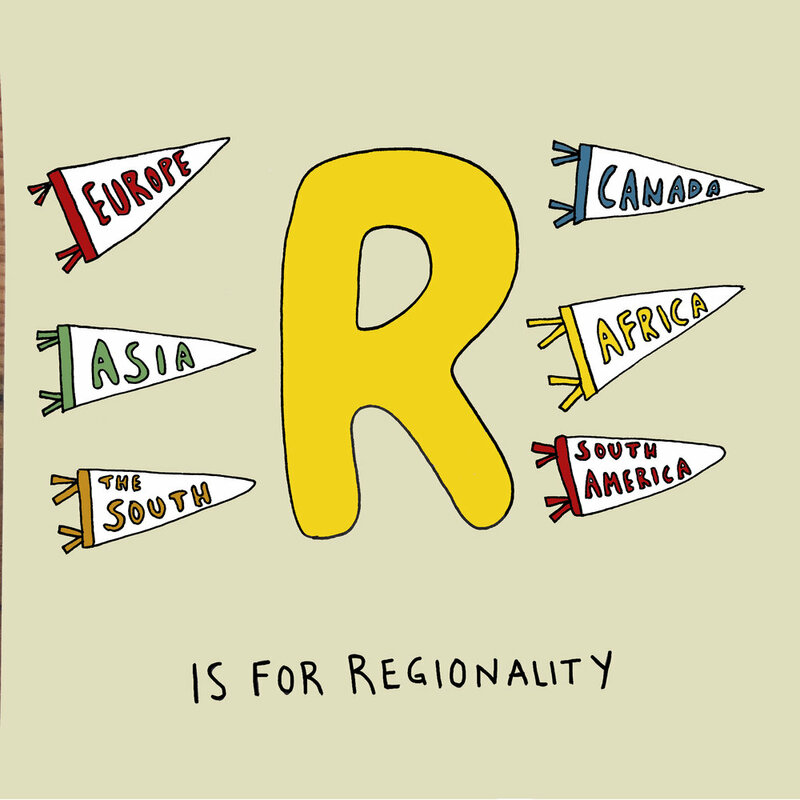 Check out the GRCA Board’s A to Z guide! This guide represents the amazing work that we do as an organization, and showcases some of what’s most important to the movement! All illustrations were created by Jen Stevens. We want our work to be as physically, culturally, and financially accessible as possible for all our members! The Shifting Power Committee collaborates with board and non-board leadership to make this happen at the conference! The GRCA Board is made up of organizers from all over the world, representing different organizations, camps, countries and regions! An all-volunteer operation, they meet in-person three times a year and are constantly in-touch throughout the year! Caucuses are spaces for those with marginalized identities to meet, heal, and build power within the GRCA movement. 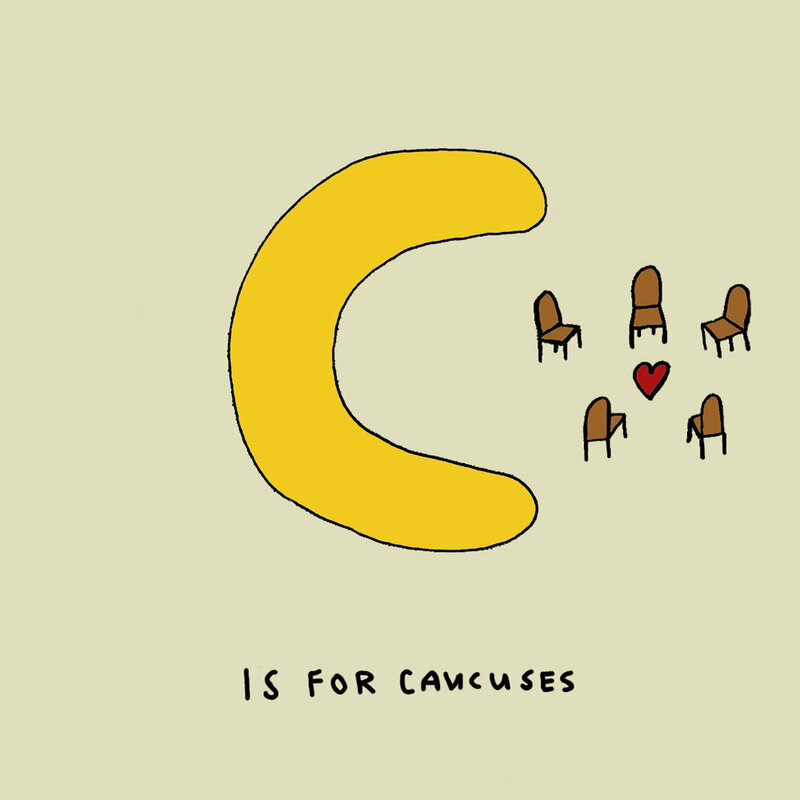 Caucuses are supported by the Caucus Advisory Counsel and Shifting Power Committee. Present and past caucuses have been held by and for trans & gender non-conforming people, people of color, poor & working class people, people with disabilities, people for whom English is not their first language, and parents. The GRCA conference holds space for movement building, learning, connection, and joy! Saturday night of the conference weekend is reserved for a dance party in the main meeting space. Important things to remember: always ask for consent, there is no wrong way to have a body, and participate in whatever way feels good for you! We know that many of our identities are fluid, and we hope the conference can be a safe(r) space to figure out what makes you feel best. Names, pronouns, conference crushes? Need some support or space to say something out loud about yourself for the first time? We’re here for all of it and we can’t wait to celebrate you. What the hell is a fingerpool? Good question. It’s a sculpture at Appel Farms that looks like fingers coming out of a swimming pool. Weird right? But in a good way! We love the fingerpool, and we can’t wait for y’all to see it for the first time or as an old friend. We live in a world that often tells us what we can or cannot do in ways that feel oppressive. At the GRCA conference we want to model a culture that feels better for folks. Group agreements are a useful tool for all conference attendees to get together and decide how we want to interact with and treat one another in the space! No matter where you call home, we are excited to learn about what you are doing and what is important to your community. We hope the conference and the GRCA will feel like a home to you too - a place where you feel safe, supported, and like you belong. At the GRCA, we recognize that privilege and oppression can and do overlap and interact across multiple types of power (such as race, class, gender, sexuality, citizenship, ability, etc.). We thank Kimberlé Crenshaw, The Combahee River Collective, and all the Black feminists who have done the work of creating the knowledge and framework around intersectionality. At the heart of intersectional identities are the structures put in place to uphold these social positions. We ask participants to recognize that a marginalized identity does not negate an area of privilege, that power structures are constantly in play regardless of good intentions, and to be cognizant of the space you may take up in relation to other participants. This year’s conference theme is “Joy Is A Revolutionary Force.” You may have seen this phrase on the GRCA’s social media over the past few months, whether in a hashtag or on shirts being sold to raise money for conference travel stipends. It’s also the final one of our proposed Points of Unity (more on that soon!). Since our work fights against so many systems of oppression, our joy can be an act of revolution, alongside all our other powerful emotions. Our joy, and the joy of the youth we work with, are tools for change. What does “joy is revolutionary” mean to you and your organizing work? Tell us with the hashtag #joyisarevolutionaryforce ! At the GRCA conference, one of our evening activities is karaoke! Come on down to the main meeting space and sign up for a song! Everyone will be ready to share joy, sing along, and support you. Don’t feel like performing? That’s great too! Hang out in Salt-n-Pepa or in the designated Quiet & Sober space. There are plenty of ways to participate in evening activities - we’re just excited to spend time with you! One of the best parts of the GRCA conference is getting the chance to share space with so many different people and organizations! We are looking forward to growing as people and as organizers by listening to what everyone has to share and learning about new ideas, perspectives, and ways to approach this work. Who runs the GRCA? YOU! Since we are a member driven organization, it is our members (full member camps/organizations) who have the formal power over the organization. When the GRCA was formed in 2007, there were 7 camps/organizations represented at the first GRCA conference. Today, the GRCA now has over 80 full member camps/organizations in 18 different countries across 6 continents! The GRCA Nominations Committee (lovingly referred to as ‘Nom Comm’) is a separate committee from the GRCA Board committees. Nom Comm acts as a liaison between members and the GRCA Board for the sake of transparency and giving power to the members of the GRCA. The Nom Comm reviews candidates for the Board and prepares a slate of nominees for recommendation to the membership, which is voted on at the Annual Member Meeting. Nom Comm also coordinates the election process for Board officers. Nom Comm is comprised of 6 members each serving two-year, staggered terms. 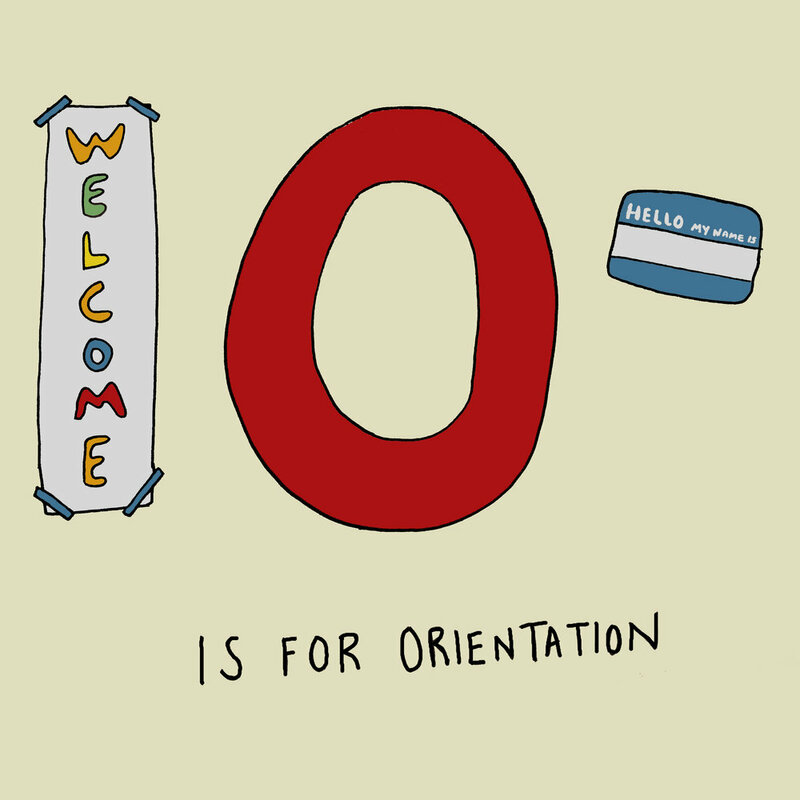 Orientation takes place on Thursday evening, and is a chance to learn about how the conference will work, get to know the Appel Farms space, and ask questions! Whether you’re new to the conference or have been attending for years, attending orientation will help you stay up to date on how to make the most of the weekend. Political Education is one of the most important types of learning for both our youth and our organizers. The GRCA conference aims to create as many formal and informal opportunities for political education as possible. (We acknowledge that political education can happen anywhere, whether in workshops or over lunch in Salt-N-Pepa!) This year, two of our workshop tracks are expressly dedicated to this kind of learning - they are the Praxis: Political Education in Practice track and the Shifting Power track. Attend workshops in these tracks to share and learn about disrupting institutional oppression in our work. “Queer” can be a complicated word - it means different things to different people, and its meanings have changed over time. It can be an “umbrella term” describing those whose genders and/or sexualities differ from what oppressive power structures say that we “should” be. “Queer” is also a political term, used to describe anything or anyone that acts against societal norms. In that way, queerness can subvert those (often oppressive) norms. Many organizers and youth within the GRCA identify as queer, and this impacts how we move through the world and how we work! We love coming together with organizations from around the world for the conference, but some issues and strategies are unique to the specific regions where our individual organizations live and work. The places and communities where we organize shape the way we organize! At conference, on Movement Day and in informal meet-ups throughout the weekend, there will be chances to connect with other folks who organize near you. We hope these meet-ups will be the beginning of collaborations that grow year-round! These sessions are meant to build an intersectional dialogue between folks who attend caucuses and other members who are interested and ready to do work that centers GRCA communities that experience structural oppression. Solidarity Working Groups will take place on Friday, Movement Day, and will be held in conjunction with caucuses, regional meet-ups, and info sessions! Tracks are sets of workshops that follow a similar theme, and track coordinators are kind of their curators -- reaching out to potential workshop leaders, taking in workshop proposals, and putting together amazing tracks for conference attendees to go to. 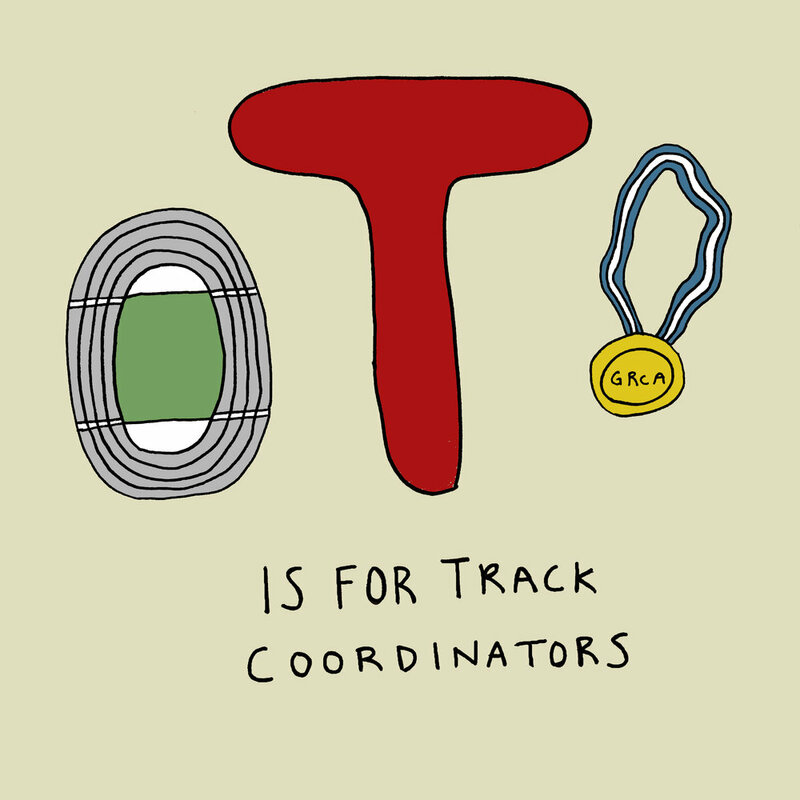 Becoming a track coordinator is open to anyone, and is a great opportunity to get more involved in the GRCA. As our network continues to grow and flourish, we believe that it is necessary to create and share tools and documents to better ground our work, stay connected to each other and our shared commitments, and make sure that our aligned values across the many camps and organizations can continue to make our movement strong. The Points of Unity are meant to give direction to our collective work, help clarify our values and commitments, and create space for GRCA membership to hold ourselves accountable. This year, member reps will have the opportunity to vote on and approve the Points of Unity proposed by the GRCA Board and Shifting Power Committee! Full member organizations vote on various things at the Annual Member Meeting (AMM)! Members decide on the board members for the upcoming operational year, elect members to the Nominations Committee, approve or reject proposals made to the AMM, and so much more! Member Representatives use voting cards to cast their votes during the meeting - green means yes, red means no, and white means abstain (neither yes or no)! Workshops take place on the Saturday & Sunday of this year’s conference. They are spaces to learn new skills, tools, and ways of thinking that you can apply at your home organizations! Workshops are coordinated across different “tracks”- feel free to attend whatever workshops are most relevant to you and your organization. Once the conference schedule is released, it may help to plan what workshops you want to attend in advance. This year, the six conference tracks are: Creating Community, Radical Approaches to Music, New Camps, Praxis: Political Education in Practice, Shifting Power, and the General track. Nothing starts with X but we are so eXcited you are coming that we wrote a song for you on our Xylophone!! 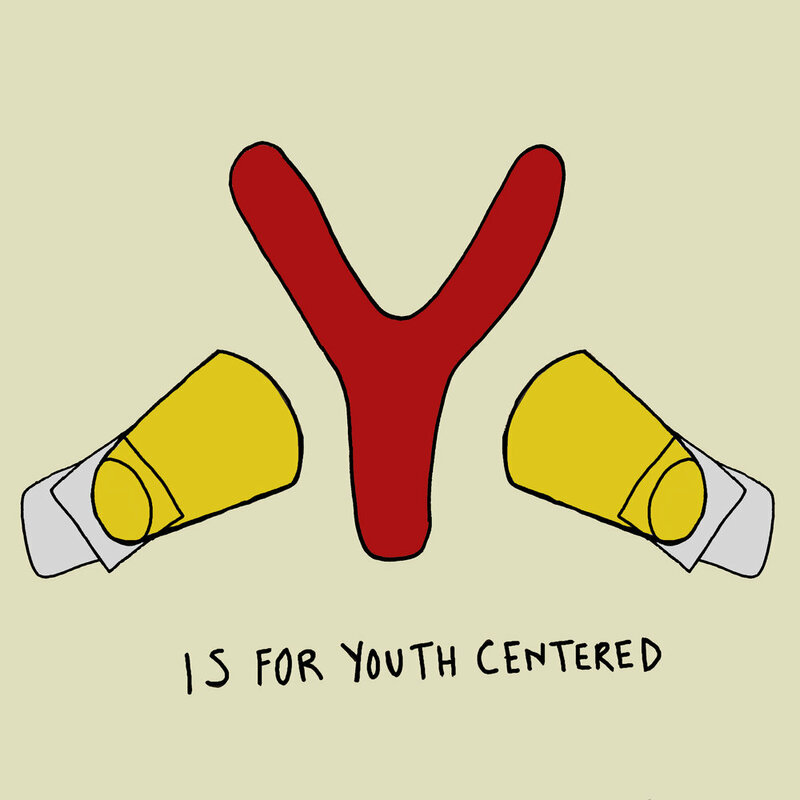 GRCA member camps center youth and are devoted to amplifying the already powerful voices of young folks. At the GRCA conference, we come together to listen to and learn from one another so we can support youth in new and better ways. A zine is a cute little DIY magazine. The one you get at the GRCA conference holds loads of crucial information about board nominees, new member camps, the conference schedule, workshop descriptions, and more. Don't leave your dorm without it!